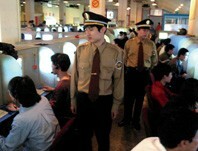 More than a thousand people show up in Beijing to boycott internet for a day. They demand an end to censorship. China has 300 million users and is concerned they might create opinion groups and exchange information. Beijing (AsiaNews/Agencies) – In a rare event for the Chinese capital a group of about a thousand people met for a public but convivial protest against government plans to install the controversial Green Dam filtering software on computers. They were responding to an invitation by Beijing artist Ai Weiwei who yesterday called for a day of boycott of the internet. Recently Chinese authorities decided that all new computers made and sold in the country must contain this filter, ostensibly to fight pornographic or other dirty websites. But many in China and abroad believe the real motive behind the move is to establish total control over mainland internet users. For this reason there have been many protests. However, on the eve of its official starting date, Chinese authorities put the web filtering software on ice. The American Chamber of Commerce in China said it was relieved of the decision. The European Union Chamber of Commerce in China urged Beijing to reconsider implementing the controversial internet filter because it “poses significant questions in relation to security, privacy, system reliability, the free flow of information and user choice”. For those who came out to protest this was but a short term victory, conscious that the battle against internet censorship must continue. Experts note however that computers currently on sale did not yet have the filter since the new rule was adopted only a few weeks ago. Implementing the new requirement right away was impossible anyway. Just before the 20th anniversary of the Tiananmen Square massacre on 4 June, the authorities blocked Google’s popular Twitter social networking service and its mainland version Fanfou to stop people from commenting the event and exchanging of information. Mainland China has an estimated 300 million internet users, more than any other country in the world. The authorities are concerned that internet might spread undesirable news and become a hub for opinion groups. For this reason they have been pressuring internet providers to accept preventive censorship and provide them with the names of those who write “undesirable” articles. As a result of articles published online many Chinese human right activists have been arrested.